For this week’s G.O.O.D. Friday MP3, Kanye reformed his ‘07-born trio with Lupe Fiasco and Pharrell Williams, Child Rebel Soldier. While CRS members have teamed up on a number of tracks over the years, this is their first release under the moniker since dropping their Thom Yorke-sampling debut, “Us Placers,” three years ago and popping up on a N.E.R.D. remix back in ‘08. Obligatory “new Yeezy track!” and “reunited rap supergroup!” hype aside, this is a killer cut that’s well worth the price of an email address. Well, I am sure there are 1000 other blogs reviewing this track! And I must say, the review above (though it doesn't REALLY express the writer's love or "like" for the track) is pretty in depth. But this is why I felt I needed to bring it to my readers! This little tidbit of Rap History is so interesting to me because Rap Super Groups are still a rarity in the industry. And like this one, most are never fully realized and go into these long term (and mostly permanent) dormant phases. But it's GREAT to see that this group of young men have come together again to make G.O.O.D. music and continue to make music history! The track itself is a BANGER! It moves fast and has some hard hitting flows from Ye', Lupe and Pharrell! Although I am not a HUGE Pharrell fan (as a rapper OR singer) but I do appreciate what he and N.E.R.D. has done and is still doing for the rap game! And of course, Lupe is ALWAYS a star on the track! He puts down and makes it happen, his verse could've anchored the track easily! And then you have Kanye! Yeezy! Ye'! He WENT HARD! As usual, as of late, he really is BACK! I think Kanye has been VERY consistent with his hard hitting and ground breaking albums. However, you cannot deny that 808's & Heartbreaks, although it WAS groundbreaking, it was very disappointing as well! But Dark Twisted Fantasy (if that is where these G.O.O.D. Friday tracks are REALLY going to appear) is truly turning out to be a GOLD MINE of HOT TRACKS! 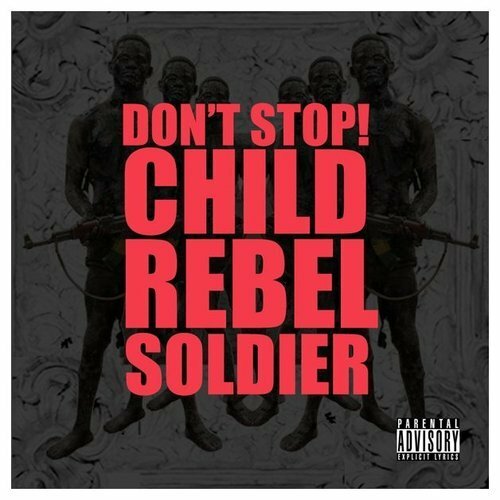 Check out Child Rebel Soldier's new HIT "Don't Stop"! You won't be disappointed!